Australia go into their first Test series since the Ashes with a strong desire to bounce back, and one could hardly dispute that the West Indies are in need of a boost following their recent troubles, so both sides should be sufficiently motivated for the three Test series which starts on Thursday. For Australia, the side is fairly settled, with Doug Bollinger confirmed as the 12th man for the First Test. Mitchell Johnson will be hoping for a return to form following his well-publicised struggles over the English summer, whilst Stuart Clark now seems to have been cut adrift indefinitely. As for the batting line-up, Shane Watson is well established as Katich’s opening partner, and the rest of the top and middle order is similarly predictable. Anything other than a series win for the hosts is unthinkable for captain Ponting, who will desperately be trying to shake off the disappointment (and the stigma) of a second Ashes defeat under his stewardship. The tourists will be boosted by the return of Chris Gayle from Jamaica in time for the First Test. Much, as ever, rests on the captain’s shoulders, as well as those of Chanderpaul and Dwayne Bravo, with the latter hoping to translate his good form for Trinidad & Tobago across to the Test format. Meanwhile, 19-year-old Adrian Barath looks set to open the batting alongside Gayle in a partnership that will have to gel quickly in the face of the formidable Aussie pace attack, not to mention the pace-friendly conditions at the Gabba. The Windies face an uphil struggle, to say the least. India are hosting Australia for a seven-match ODI series, which normally would have been hyped for weeks (if not months) in advance, but the Ashes (and its attendent ODIs) blurred into the Champions Trophy which blurred into the Twenty20 Champions League which only finished yesterday, so it’s almost as if the series has crept up on both sides. For India, the headline news is the return of Virender Sehwag and the injury worries over Yuvraj, but it’s the bowling attack which is arguably under pressure after a poor run of late. Munaf Patel returns to give the seam bowling a little more control, whilst the pressure is mounting on Harbhajan to shrug off his recent slump and return to the form he showed before the Champions Trophy. For Australia, there are fewer concerns, although the absence of Michael Clarke will probably necessitate some tinkering with the batting order. Most of the side will be familiar with Indian conditions through IPL and more recently Champions League experience, although the fatigue factor after exertions in the latter may come into play with regard to the likes of Brett Lee. Although those Aussies who played for NSW in the Champions League will be a little on the tired side, I would expect Australia to have the upper hand in the series unless India significantly up their game. The hosts’ poor showing at the Champions Trophy has cast doubt on their ambitions to be the worlds’ best. Lee and Johnson: what might have been? Mitchell Johnson, after a disappointing Ashes series (even allowing for his fine showing at Headingley), is showing English crowds what he’s capable of. After taking a wicket with his only ball of the rain-curtailed Twenty20 series, he was at it again at The Oval, taking 3 for 2 from his 7 overs as Australia won by 4 runs. The potency of Johnson and the equally impressive Brett Lee as a strike partnership may have Australian fans pondering what might have been if the two had bowled together in the Test series. Whilst Hilfenhaus, Siddle and Clark picked up plaudits in some quarters, it’s hard to escape the feeling that the series was ultimately decided by two awesome bowling spells (particularly, of course, Stuart Broad‘s at The Oval) which Australia’s pacemen couldn’t quite deliver. Speculation is of course an idle pastime, but there are certainly plenty of Poms who reacted to Lee’s injury at the start of the summer in much the same way as they did four years earlier when Glenn McGrath managed to injure himself in a warm-up without so much as an Owais Shah leg-biter to blame. I don’t think anyone is saying that Lee would have had as much impact as McGrath undoubtedly would have in 2005 (indeed, I made that point at the time), but the Aussie pace attack might have been a little more stable with his involvement. England go into the One Day series against Australia still riding relatively high on the euphoria of Ashes victory, althouhg their confidence must surely have taken a serious knock following their close escape in Ireland and their awful start to a rain-interrupted innings in Manchester on Sunday. The prospect of 7 ODI matches without KP or Freddie may not be enough to keep the interest of the casual viewer (or even the Australian coach), but there is still likely to be plenty of interest from fans keen to sample a little post-Ashes bonhomie from a side which, lest we forget, is actually in good ODI form. For Australia, the 50-over matches are a chance to salvage something from a disappointing summer of World Twenty20 and Ashes failure. The return of Brett Lee to the side added some potency at Old Trafford, and with him opening the attack alongside Mitchell Johnson, England’s top order will have to show a lot more solidity than has been traditional if the home side are to have any success. The two sides haven’t actually met in a ‘traditional’ One Day International since the 2007 World Cup, but Australia’s dominance is such that England will do well to win even two or three of the seven matches, particularly without their strongest One Day players. 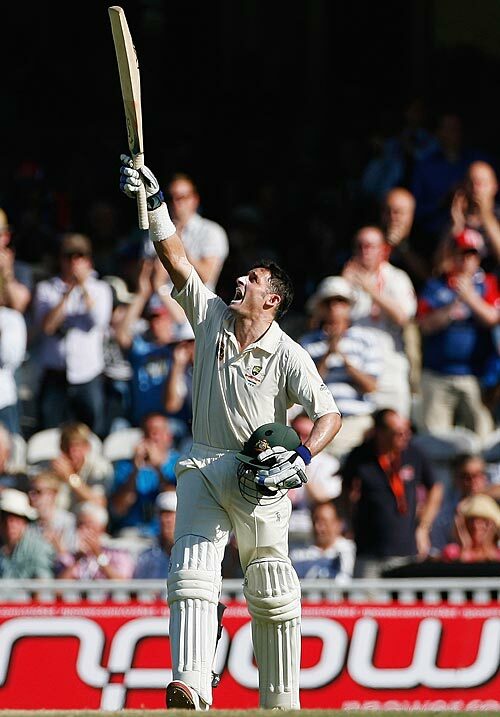 Congratulations England, farewell Flintoff, hard luck Hussey, and hats off to young Broad. Australia are facing an almost impossible task to avoid defeat at the Oval after Jonathan Trott made an impressive ton on debut as England set the tourists a stratospheric 546 to win. If any side is capable of making 546, it’s the side that made 674/6 at Cardiff (albeit in very different conditions), and if any side is capable of losing a Test from such a commanding position, it’s definitely England. Nevertheless, the open-top bus is surely booked, the vats of alcohol on their way to the dressing room, and the obituaries for Australian cricket being composed. The decision by Australia not to include a spinner in their side for the final Test has already come in for a lot of criticism, but it is clearly apparent that Australia have had bigger problems than that throughout the series. Whatever happens tomorrow (and, if there’s any play, on Monday), there will probably be people who will say this has been a classic series. Based on the quality of the two sides, the general standard of cricket on display and the overall intensity, ‘classic’ would be putting it far too strongly. After all the hype, the mind games and the avian pitch invasions, the Ashes are about to reach their denouement at the Oval. It might not be as tense as 2005, but cricket fans across the globe will still be calling in sick, scheduling phantom ‘meetings’ that last the same amount of time as the afternoon session, hiding behind the sofa and trying to teach their non-cricket-fan friends and colleagues the intricacies of the LBW rule.